Don’t spray & pray. Applying for an internship is not like playing the lottery. Spamming any and every potential employer’s inbox with your resume does not improve your chances of getting hired. Don’t lie. If you think you have to misrepresent yourself to get the position, it probably isn’t right for you. This goes for everything from fudging numbers to faking enthusiasm. Insincerity is detectable in text, and this reflects especially badly on you if you’re applying for a position in communications. Get a referral if you can. This often isn’t possible if you’re a student or recent grad with little to no experience, but you should still explore all your options. As this recent New York Times article explains, it’s more important than ever. One thing you can do while you’re still in school is build great relationships with professors in your department. Many have connections with professionals in their industry, and even if they don’t have an internship opportunity for you, you can ask to use them as a reference later on. 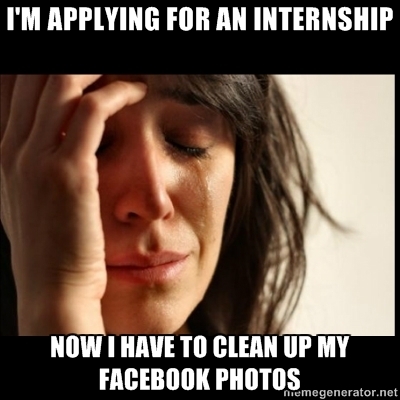 Don’t limit yourself to what’s on job/internship listing websites. You already know those listings are getting dozens of applicants. Don’t be afraid to reach out to any company you really want to work for – genuine enthusiasm will only help your cause. Include one. If you’re applying through a web form, you can still find a way to include a cover letter. The cover letter is where you make your first impression, and without one, most employers won’t even look at your resume. It’s also your writing test so make sure it’s flawless and have at least one other person look it over. Don’t address it to, “to whom it may concern.” Take the time to find the name of the appropriate person. For a smaller firm, you can address it to the CEO. For a larger firm, find out who’s in charge of human resources or recruiting. If you can’t find it on the company’s website, call and find out. Tailor it to the company and position you’re applying for. Show some indication that you’ve taken time to look into the company and what they do. Everyone likes to feel special. Show, don’t tell. Giving concrete examples of how you’ve demonstrated great attention to detail or stellar interpersonal skills is much more convincing than merely saying that you have these qualities. If you have any especially relevant work experience, summarize it here. Keep it to one page. No one applying for an internship has so much experience that it won’t fit on a single page. If you state an objective on your resume, make sure it fits the position you’re applying for. If your GPA isn’t very high, leave it off. Think about how you can best outline your work and academic experience for the position you’re applying for. If you’ve held numerous part-time jobs while going to school, you probably don’t need to include every single one. Job descriptions should be tailored too. For example, if you’re listing your experience as a restaurant server for a PR position, you can focus more on the creative problem solving and guest service aspects of the job than the food handling or cleaning duties you had. What really made a difference for me was narrowing my focus. I started out applying for many positions but then began to concentrate only on positions that I really wanted. That meant spending a lot of time doing research for every position, but in the end, it yielded positive results. Lastly, if you do happen to come across your dream internship, don’t be afraid to be a little creative so you’ll really stand out. For a writing test for an editorial internship, I submitted my response using the company’s web template, so it looked like I’d really written a post on their blog. There are many famous examples, like this fellow, who designed his resume to look like an Amazon product page. In the end, getting hired is never an exact science. Do you have any additional tips or success stories to share? This entry was posted on February 6, 2013 at 9:12 am and is filed under Uncategorized. You can follow any responses to this entry through the RSS 2.0 feed. You can leave a response, or trackback from your own site. I tell my students to put “accomplishment data” bullets under thier jobs, even the high school ones. One of my students was an umpire in high school and in a few words, he concluded it with “helped me learn conflict managment resolution skills with adults” and he got a job at a sports talk radio station in Chicago. That’s a great suggestion, especially since many applicants list work experience that may not seem relevant at first glance.